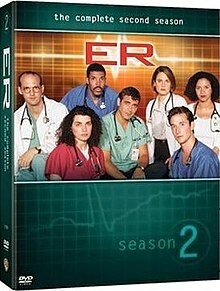 The second season of the American fictional drama television series ER first aired on September 21, 1995 and concluded on May 16, 1996. The second season consists of 22 episodes. Greene's attempts at balancing his work and family after moving to Milwaukee comes to an abrupt end when his wife is caught cheating on him with a colleague, the divorce becomes final and he starts dating again. At work, he is promoted, becoming an attending physician. He locks horns with close friend Dr. Ross, whose reckless professional behavior is called into question by the hospital authorities, and new Chief Resident, Dr. Kerry Weaver. Ross breaks protocol to treat an HIV-positive child and is about to be fired. He has already accepted a job at another medical facility when he heroically saves a child, trapped in a sewer in the landmark episode "Hell and High Water". His heroism creates a media sensation and the hospital reconsiders its decision when Dr. Ross receives an award for outstanding community service. Later in the season, his father returns, and while attempting to bond his father again walks out on him. While tracking him down Doug becomes embroiled in a relationship with his father's girlfriend. Lewis is left holding the baby when her sister, Chloe, skips town, leaving daughter Suzie in Susan's care. She struggles to find time to care for the child and complete her residency. She considers having Suzie adopted, but at the last minute decides to keep her. Just as Susan starts to become attached to the baby, Chloe returns, a changed woman, and a short custody battle ensues. Eventually, Susan hands Suzie over to Chloe and is left devastated when her sister and her new husband move to Phoenix, taking the baby with them. Carter, now a fourth-year medical student, starts a relationship with medical student Harper Tracy. He becomes involved in the treatment of an elderly patient and her husband (played by comic Red Buttons) in order to secure his place in developing a new heart procedure study and a spot in the surgical program. After the surgery is complete, the woman's condition deteriorates and Carter is overwhelmed by the husband's constant needs. The woman's subsequent death results in tremendous personal guilt, but Carter still manages to win a place as a surgical intern despite the fierce competition. Hathaway becomes involved with paramedic Shep. Their relationship develops quickly and they move in together. However, things go wrong when Shep's partner, Raul, suffers third degree burns to over 85% of his body during a fire rescue and dies shortly afterward, resulting in emotional crisis and guilt for Shep. Shep grows volatile and violent, and after he refuses Carol's recommendation that he see a psychiatrist, the couple separate. At the start of the season, Dr. Benton is in a relationship with Jeanie Boulet. She ends the relationship in a bid to save her marriage, but soon starts working as a physician assistant at County General. Benton is frosty towards her and is angry when he finds out about her divorce from her husband. At the end of the season, Jeanie finds out that she may be HIV-positive after her ex-husband, Al, is diagnosed. She informs a dismayed Peter and suggests that he too be tested. Benton also struggles to decide whether to lodge a formal complaint against his mentor Dr. Vucelich, when he discovers irregularities in his research method. First season executive producers John Wells and Michael Crichton reprised their roles. Wells continued to serve as the series head writer and showrunner. Lydia Woodward and Mimi Leder returned as co-executive producers. New producer Carol Flint filled the third co-executive producer position following the departure of Robert Nathan. Christopher Chulack continued to act as the episodic producer. Paul Manning and Wendy Spence Rosato also continued in their first season roles as producer and associate producer respectively. Several changes occurred with the production team mid-season - Leder left the crew, Manning was promoted to supervising producer, and Spence Rosato was promoted to co-producer. Wells, Woodward, Flint, and Manning continued to regularly write episodes, with each contributing to 4 episodes this season. First season regular writers Neal Baer and Lance Gentile became story editors for the second season and continued to write episodes. Baer contributed to two episodes while Gentile continued to act as the series medical consultant and wrote a further episode. Both were promoted to executive story editors by the close of the season. First season writer Tracey Stern also returned and contributed a further episode. First season technical adviser Joe Sachs reprised his role and also made his television writing debut on the second season. The series other new writers were Belinda Casas Wells and Anne Kenney; Casas Wells contributed to the story of an episode and Kenney wrote a single episode. Leder and Chulack continued to regularly direct episodes. Returning first season directors Félix Enríquez Alcalá and Donna Deitch each directed further episodes in the second season. New directors Thomas Schlamme and Lesli Linka Glatter each contributed two episodes this season. Crew members Lance Gentile and Director of Photography Richard Thorpe both made their episode directing debuts this season. Cast member Anthony Edwards also directed his first episode. Other directors new to the series include Eric Laneuville, Dean Parisot, Whitney Ransick, and Barnet Kellman. Carter is hours late for his first day as a surgical intern and Benton's not happy about it. Lewis tries to help Chloe and Baby Suzie. Greene has two choices for the new Chief Resident post. Kerry Weaver is chosen as Chief Resident of the ER. Also, Hathaway treats a man after he is found drowning in his own vomit. This episode begins the Second Season of ER. Hathaway goes on a ride-along with paramedics to get her recertification. Ross deals with a troubled child who sets things on fire to gain attention. Greene appoints Kerry Weaver as Chief Resident and she clashes with Ross. Lewis is left to take care of little Suzie when Chloe leaves town. Carter loses his very first official patient. Greene decides to avoid the hassle of his daily commute by staying with Ross. Benton hurts his hand in a fight in a parking garage, which allows Carter to take his place in surgery. Lewis considers adoption and comes to better terms with Weaver. It is Weaver's day off. Lewis decides to keep little Suzie. Ross gets some help from Harper when caring for a four-year-old AIDS patient and clashes with Greene over the case. Benton treats a woman who has been abused by her husband - a cop. Ross might lose his job after he runs afoul of the Pediatrics Chief. Harper has a confession to make. Jeanie Boulet starts working in the ER as a Physician's Assistant, but the relationship between her and Benton remains hostile. Hathaway buys her first house. Ross accepts a private practice position, but finds his inner hero when he helps a little boy trapped in a storm drain. Carter and Harper remain estranged during a case where a child is hit by a car and her divorced parents arrive at the ER. Greene rushes to Milwaukee after hearing his wife and daughter were in a car accident only to receive some more surprising news. Carol treats a kind young artist who is schizophrenic. Lewis puts Suzie ahead of an opportunity to present a case at a medical conference. Christmas becomes a time for miracles for both patients and the ER staff. Hathaway hosts the Christmas party and receives a surprising gift. A Holocaust survivor who was carjacked awaits news on her granddaughter and restores some of Greene's faith, while Jeanie mediates when gang members want to get revenge after a beloved Catholic priest is shot to death. Carter gets the chance to control the treatment of an elderly patient without Benton's supervision. Benton gets invited to a formal dinner party by Dr. Vucelich. Greene receives the summons for his divorce. Twenty-two children locked up in an apartment get sent to County for medical treatment. Carter's relief is short lived when his patient returns to the ER. Benton attends his boss' dinner party and takes Boulet as his date. Morgenstern is admitted to the ER for a fractured leg wearing a kilt. Greene spends the day with his daughter, Rachel, who is unhappy about his separation from his wife and hostile towards Lewis. Carol tells Ross to ease up on a father who was a drunk but is now sober and trying to be strong for his young son. Greene works on a case where a patient dies for no apparent reason and then gets bad news regarding the O'Brien lawsuit. Carter takes credit for Harper's findings. Benton becomes suspicious of Dr. Vucelich's research. Benton learns that doing the right thing is not always that easy. Rumors fly that Greene and Lewis are having an affair, while Lewis intervenes in a case involving a couple where both parties are drunk and one has AIDS. Ross has an unexpected encounter. The maternity ward experiences some sprinkler malfunctions and eight expectant mothers are brought to the ER. Ross and his father finally have a fun evening together, and Harper faces a pregnancy scare. Benton attempts to fix an apparently hopeless attempted suicide case. Hathaway worries when she learns her paramedic boyfriend, Shep, has run into a burning building to try to save the kids inside. However, it is Shep's partner, Raul, who suffers the worst injuries and the ER staff grieves in the aftermath. Carter has difficulty treating third-degree burns. Chloe returns to Susan's dismay. Lewis' sister Chloe says she wants baby Suzie back, but Susan's not interested in dealing with Chloe. Benton feels guilty about his own inability to do the right thing, so he betrays Ross when faced with an ethical dilemma, earning him the enmity of both Ross and Greene. Greene tries a cooler image and gets sympathy from an attractive TV producer. Carter celebrates his match to County in a way that might end his medical career before it begins. It is Greene's fourth night on the graveyard shift and things are not looking too great when it is being overrun with patients. Tension continues between Greene and Benton, but the shift work brings greater respect between Greene and Carter. Hathaway notices a dramatic change in Shep's behavior. Weaver begins filming the procedures in the ER. Carter's sneaky moves to get more surgical work ruins his relationship with Harper. Lewis finds out she will not win her custody battle because Chloe seems to have cleaned up her act. Benton decides to officially charge Vucelich with fraud. Lewis deals with losing custody of little Suzie by working an extra shift, impressing Weaver in the process. Greene comes to friendly terms with his ex-wife Jen as their divorce is finalized. Carter works with Ross in a pediatrics rotation. Boulet learns something disturbing about her ex-husband Al. Hathaway covers up for Shep's increasingly violent mood and gets him cleared of work charges, but recognizes he has gone over the edge. Weaver makes a deal with Greene in her quest in becoming an ER attending. Lewis has therapy sessions to mourn the loss of little Suzie. Lewis refuses the position as chief resident. Boulet tells Benton he must get tested for HIV. Hathaway quits in disgust and tells Shep she cannot be with him anymore. Carter misses his degree ceremony and then decides to join Benton's team for his surgical residency. ER's second season proved to be very popular when it became the number 1 show in the US. Nielsen Viewer ratings and viewers were also exceedingly high, especially for "Hell and High Water". British magazine Empire found the best ER episode was the seventh titled "Hell And High Water" where "Doug Ross (George Clooney) saves a young boy from drowning during a flood." Region 1 DVDs have subtitles available in English, French and Spanish. Audio commentaries are available for episodes 1 and 16, with Mimi Leder, editor Randy Jon Morgan, and Laura Innes). ^ Episodes 1, 2, ? ?, 9, 12, 13, 18, 20, 22. ^ a b c Episode 15. ^ Episodes 3, 4, 12, 14, 15, 17, 19, 20. ^ Episodes ? ?, 9, 10, 11, 12, 13, 14, 22. ^ Episodes 1, 2, 3, 4, 5, ? ?, 9, 10, ? ?, 13, 15, 17, 19, 20. ^ Episodes 1, 2, 3, 5, ? ?, 13, 14, 15, 16, 17, 18, 19, 21, 22. ^ Episodes 3, 4√, 5√, ? ?, 9, 10, 11, 16, 18, 20. ^ Episodes 1, 2, 3, 4, ? ?, 9, 10, 11, 16, 17, 18, 19, 20, 21, 22. ^ Episodes 2, 3, 4, ? ?, 11, 16. ^ Episodes 3, ? ?, 9, 12, 20, 22. ^ Episodes 1, 2, 3, ? ?, 16, 17, 18, 19, 20. ^ Episodes 5, ? ?, 19. ^ a b Episode 5. ^ Episodes 2, 11, 21, 22. ^ Episodes 14, 15, 16. ^ Episodes 1, 2, 5, ? ?, 11, 14, 18, 20, 21, 22. ^ Episodes 3, 4, 5. ^ Episodes 10, 11, 12, 14. ^ Episode 17, 19, 21. ^ Episodes 19, 20, 21, 22. ^ a b c d e f g h "Nielsen Ratings: September-November 1995" (PDF). USA Today. Retrieved May 22, 2015. ^ a b c d e f g h "Nielsen Ratings: November-February 1996" (PDF). USA Today. Retrieved May 22, 2015. ^ a b c d e f "Nielsen Ratings: February-May 1996" (PDF). USA Today. Retrieved May 22, 2015. ^ This episode is dedicated to Paul Leder. ^ "Empire Features: ER". Empire. 2008. Retrieved February 6, 2012. ^ ER, Season 2 DVD box booklet. This page was last edited on 16 February 2019, at 14:47 (UTC).